Entertainment consumption on mobile screens is increasing by the day. As more and more users turn to their mobile screens for viewing movies, listening music and watching videos, media and entertainment brands all over are vying to capture consumer’s attention through small screens. 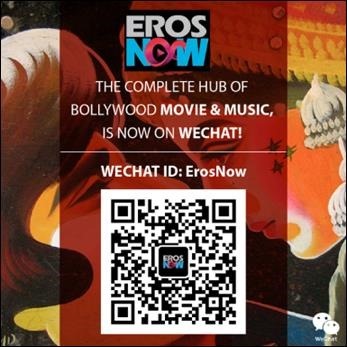 Owing to this growing trend, ErosNow, the dedicated online entertainment service of Eros International, a leading global company in the Indian film entertainment industry has announced its Official Account on WeChat. Through this Official Account, WeChat users would be able to enjoy unlimited music, movies and get sneak-peek into all the action and buzz on Bollywood. Eros is one of the first Indian film studio to take such a step on one of the most popular messaging apps amongst youth of the country. “At WeChat, we have constantly endeavored to bring to our users, content and associations which add value to their overall WeChat experience. Through WeChat’s Official Accounts, we have consistently evolved and innovated the kind of partnerships and associations we bring forth to our users. ErosNow is another step towards bringing engaging content and entertainment offerings for our users”, said Nilay Arora, Vice President – Marketing and Business Development for WeChat India. To follow ErosNow Official Account (on Android/iOS), WeChat users need to search for “ErosNow” in the search bar or scan the QR code below. Then follow the instructions in the welcome message to get started!